Saxophonist Andy Sheppard produces a rich and resonant collection of reflective work, combining gentle tunes with atmospheric improvisation in this new volume of his ECM journey. Sheppard, born in Wiltshire and long associated with the Bristol scene, has over the past three decades become a world leader. He is one of a very short list of saxophonists (perhaps along with Lester Young, Stan Getz and John Coltrane) to have a distinctive sound on tenor sax which can be recognised from just a few notes. Sheppard’s signature tone is huge and yet smooth and silky – achieved, I understand, with a wide-open mouthpiece and hard reeds, a combination which would reduce the embouchure of normal mortals to jelly. 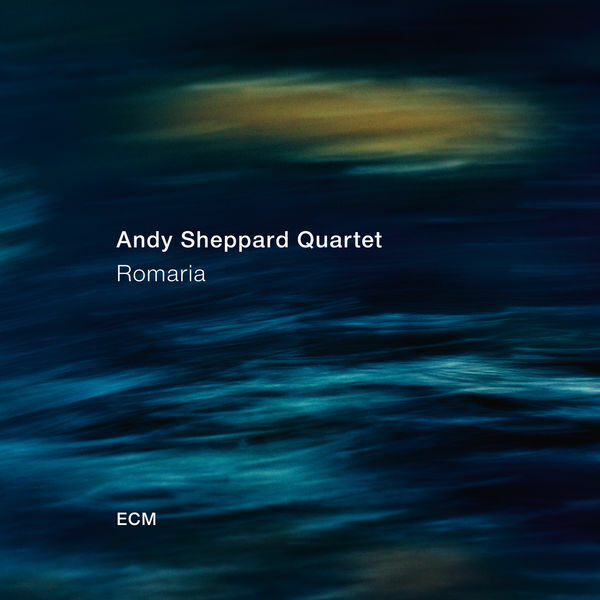 Sheppard’s recent career combines being a featured soloist and collaborator with Carla Bley with work under his own name with Trio Libero (including Seb Rochford on drums and Michel Benita on double bass). This line-up is now expanded by the addition of Norwegian guitarist Eivind Aarset, who first collaborated with Sheppard on his 2008 album Movements In Colour. Aarset’s contributions to this collection are significant, often producing sustained tone colouring which gives an extra layer to the textures and soundscapes. The resulting album – recorded over an intensive two-day period in Lugano, Switzerland with the musicians fresh to the material and ECM legend Manfred Eicher in the producer’s seat – is a beautiful and satisfying whole creation. Sheppard has said (in a preview feature for London Jazz News – link below) that he hopes this album will be listened to as a complete set. It certainly pays off to hear the whole thing in order – the eight pieces flow together with ebbs and flows, understated melodies which shift imperceptibly into improvised passages. The quartet work together with quite breath-taking sensitivity, being on-it and yet not overconfident, which must surely be the result of the deliberate process adopted by Sheppard and Eicher of carefully not over-preparing the group but allowing their interactions to emerge in a superb studio acoustic. The album is bookended by And A Day… and Forever…, two companion pieces with stately tenor sax melodies supported by double bass and gentle tom-tom rhythms. The bass solos from Benita are a particularly fine element, grabbing the attention with movement and impact against the smooth backing from Rochford and Aarset. Sheppard’s performances here are a lesson in doing a lot with a little, each note placed, extended, tonally judged and lipped with his sound fine and consistent right across the range of the tenor sax. His soprano sax playing is remarkable (as ever), consistent with his tenor sound, running around over Rochford’s sparkling cymbals on Thirteen. It seems invidious to focus on individual tracks in this all-of-a-piece collection, but the title track, Romaria, is a beautiful rendition of a Brazilian pop song from the 1970s written by Renato Teixeira and made famous by Elis Regina. This is no samba-bumping Latin workout but rather another superbly precise and atmospheric rendition, a mini-masterpiece which sits beautifully within the album. Overall, this feels like the best solo work Sheppard has produced for some time and is clearly set in a sound world where he feels most at home and most able to play to his own heart – and to ours. The Andy Sheppard Quartet will be playing in Cheltenham Town Hall on Sunday 6 May as part of the Cheltenham Jazz Festival.